While New York Mayor Bill De Blasio was making plans to meet with New York City police union leaders, his staff was working the phones urging Democrats to blast PBA President Patrick Lynch and other officers who turned their backs on the mayor following the assassinations of two NYPD officers. 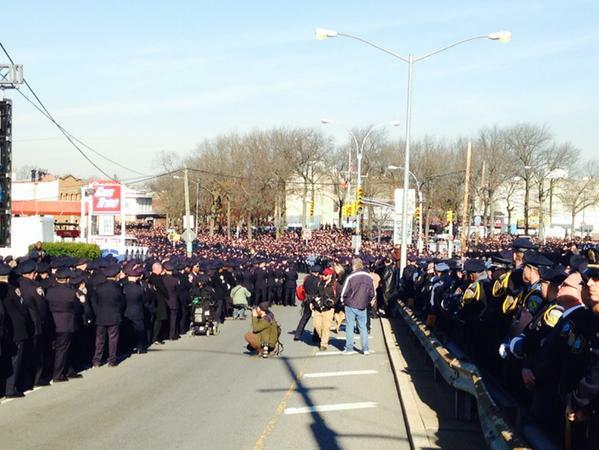 Hundreds of police officers turned their backs on Mayor De Blasio during the funeral of Officer Rafael Ramos. While Mayor Bill de Blasio was personally coaxing the city’s police union presidents to meet with him, his top aides were on the phones with lawmakers urging them to blast PBA President Patrick Lynch and other officers for turning their backs on the mayor following the assassinations of two of New York’s Finest, DNAinfo New York has learned. As late as Monday afternoon — the same time de Blasio was speaking with police union leaders to set up Tuesday’s détente to possibly mend their fractured relationship — the mayor’s government affairs honchos were privately cold-calling the city’s Democratic delegation of city and state elected officials, asking them to publicly criticize Lynch and those officers who dissed the mayor.